August 31, 2018, Adrian, Michigan – When students begin the academic year at Dominican high schools, some will have much to say about the Dominican heritage. More than 100 students representing 19 schools left the 20th Annual Dominican High Schools Preaching Conference in Adrian with a greater understanding of the Order of Preachers – and with specific action plans for expanding their classmates’ awareness of the Dominican family and spirituality. Students process with the Word of God prior to the Gospel proclamation during the Sending Forth Mass. 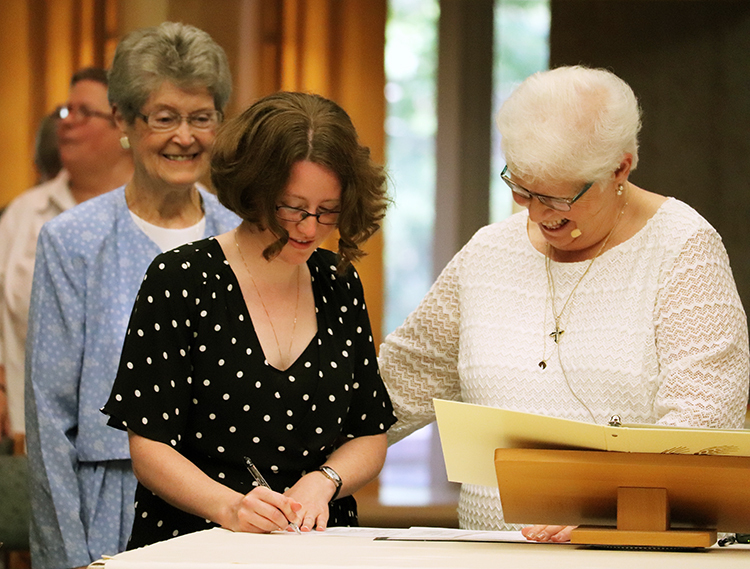 The 2018 conference was in late June at Siena Heights University in Adrian included many events and activities that made tangible the spirit of the Dominican order. “The conference is a wonderful place to learn how you can involve yourselves and your schools more in the Dominican faith,” said Lucia Wileman, a student at Rosary High School in Aurora, Illinois. 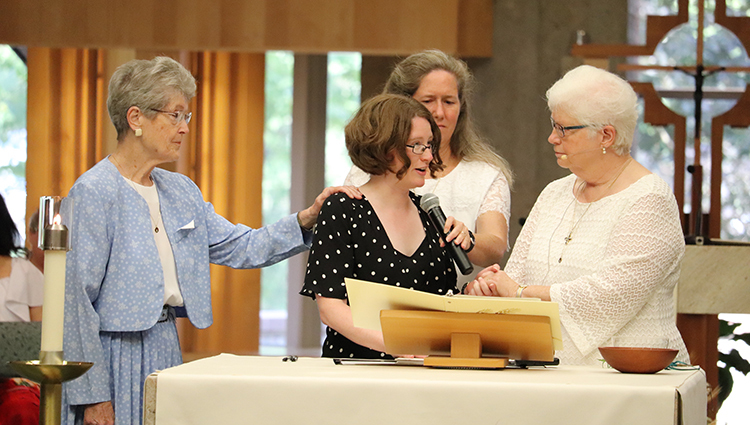 Her classmate, Abby Homer, added, “I can’t wait to bring this knowledge back to my school.” Rosary High School is sponsored by the Springfield Dominican Sisters. 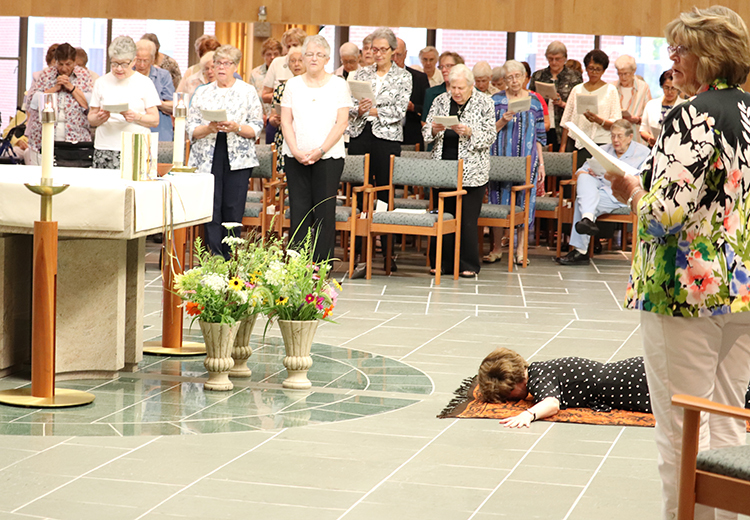 Sister Mary Soher, OP, an Adrian Dominican Sister and Director of the Conference called the event a wonderful success, thanks to the quality of the presenters, welcoming hospitality at the Siena Heights University and Adrian Dominican Motherhouse campuses. Along with Adrian Dominican Sisters, sponsoring Dominican congregations and provinces were Dominican Sisters of Amityville, New York; Caldwell, New Jersey; Houston, Texas; Mission San Jose, California; Peace in Columbus, Ohio; Racine, Wisconsin; Sinsinawa, Wisconsin; Sparkill, New York; Springfield, Illinois; and the Friars from the Province of St. Albert the Great. The young preachers first learned about some of the better-known Dominican saints from Patrick Spedale, campus minister at St. Pius X High School in Houston, Texas, who portrayed St. Dominic; Sister Nancy Murray, OP, Adrian, as St. Catherine of Siena, a 13th Century mystic, reformer, and Doctor of the Church; and Sister Marilín Llanes, OP, Adrian, as St. Antonio Montesinos, noted for speaking out on behalf of the indigenous people of Hispaniola who were exploited by the Spanish conquistadors. 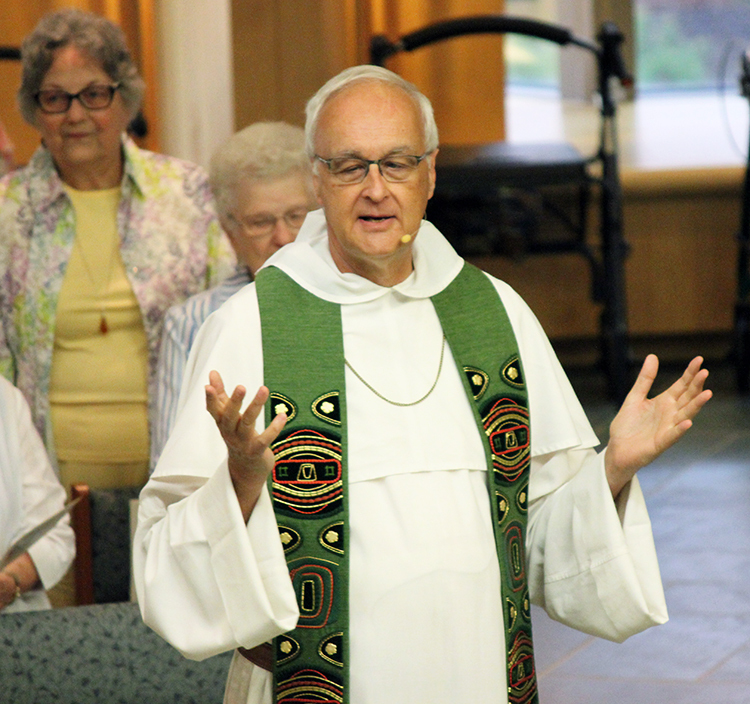 Brother Joseph Kilikevice, OP, of the St. Albert the Great Province, spoke on the interfaith mission of the Order. 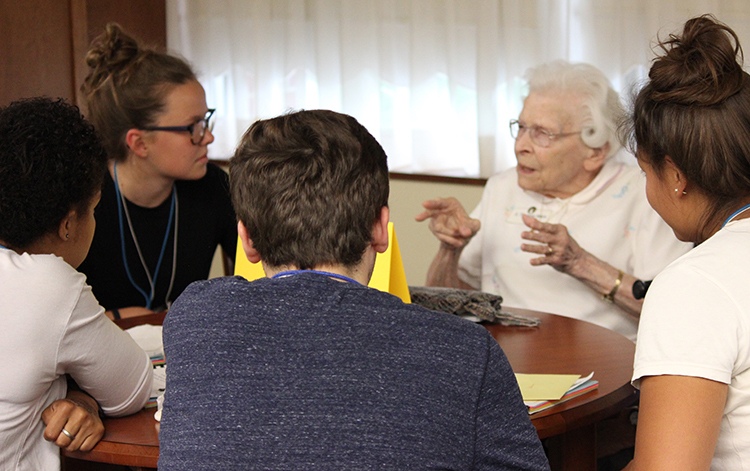 Sister Therese Mary Foote, OP, enjoys a social with students from Edgewood High School in Madison, Wisconsin. 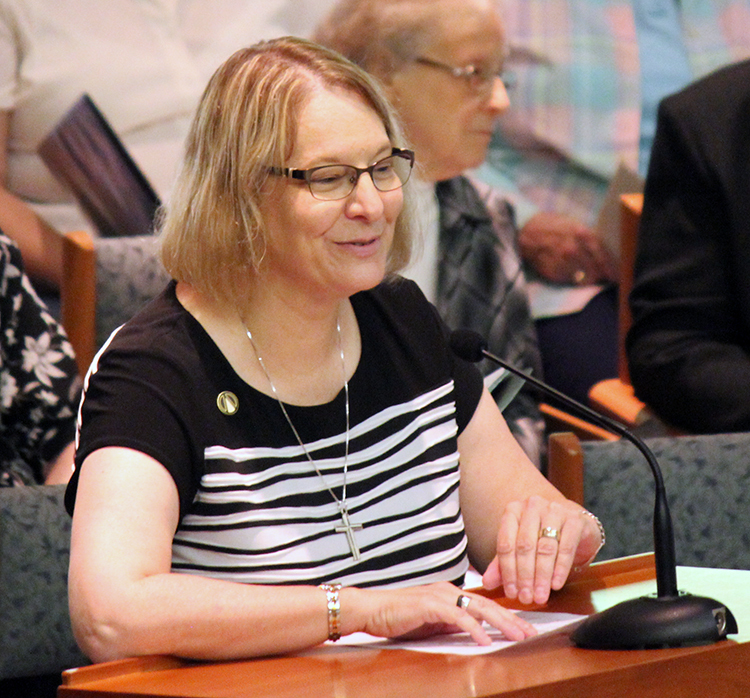 During the session on Preaching the Signs of the Times, the students learned about various social justice issues, including immigration, interconnectedness of life on Earth, women’s pay equity, and justice issues. 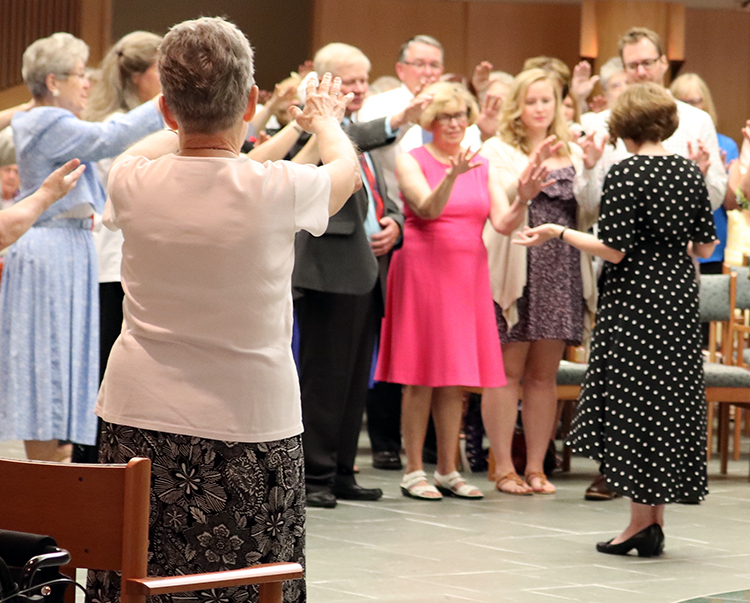 Representatives of various branches of the Dominican family were on hand to introduce the students to the diversity of Dominicans – Associates, Dominican Laity, Friars, Sisters, and Nuns. Students also had the opportunity to spend time with Adrian Dominican Sisters and meet their Sister prayer partners during a social. A part of one day of the conference was spent in preaching through action as participants served local charities. Finally, Sister Barbara Schwarz, OP, Amityville, former President of the Dominican Institute for the Arts (DIA), gave a keynote address on Preaching through the Arts. 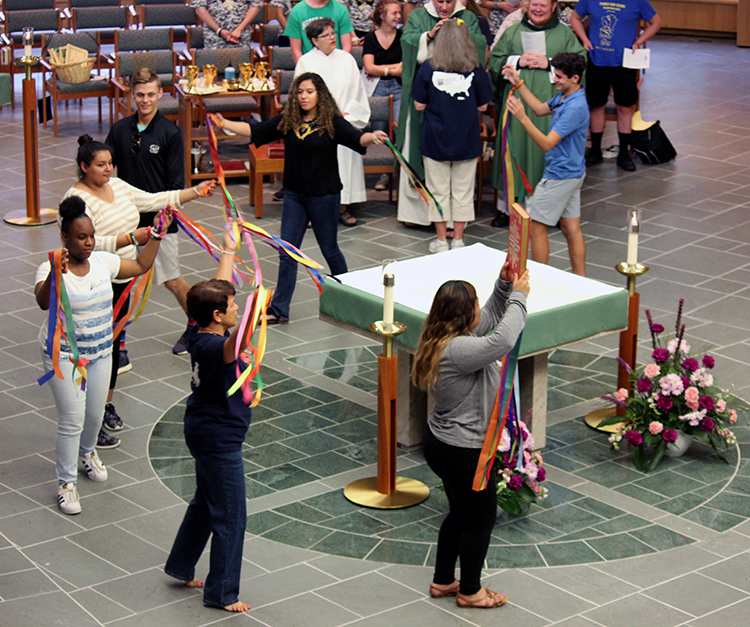 Participants experienced preaching through specific arts during breakout sessions that included liturgical dance, preaching, and visual arts. Sister Mary Soher, OP, offers a reflection during the closing Mass. 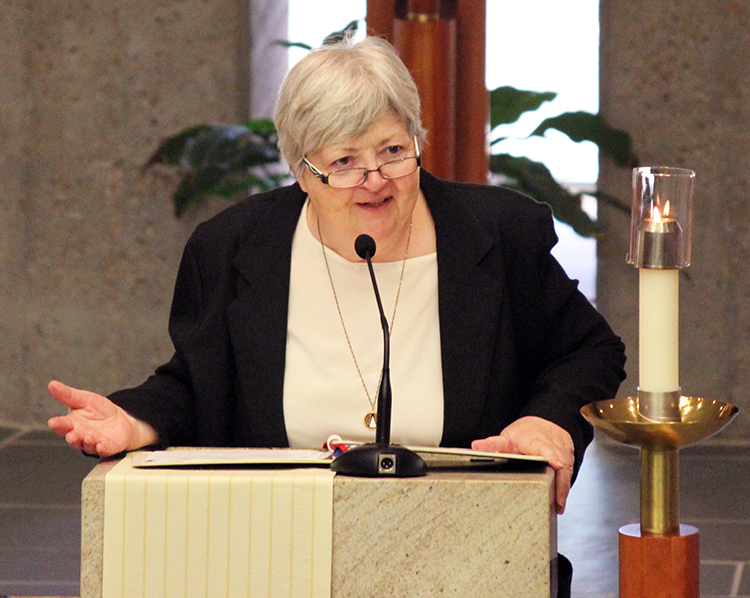 During the closing banquet, Sister Mary recalled the history of the Dominican High Schools Preaching Conference. 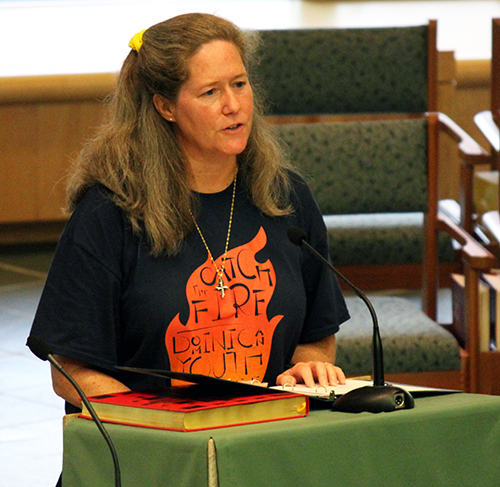 Sister Gina Fleming, OP, Amityville, who started the National College Preaching in Action Conference in 2002 for Dominican colleges and universities, received the Sister Pat Brady Award for her involvement in spreading the Dominican charism to young people. During the closing Commissioning Mass, Dominican high school students took their place as young Dominicans, preparing to deepen the Dominican heritage in their classmates back home through specific action plans. The fruits of the conference and of the young preachers’ learning will be seen in the coming school year, as the students enact their plans to deepen the Dominican heritage at their high schools. Feature photo (top): Students from a Dominican high school present an action plan for bringing the Dominican spirit to the school this year. 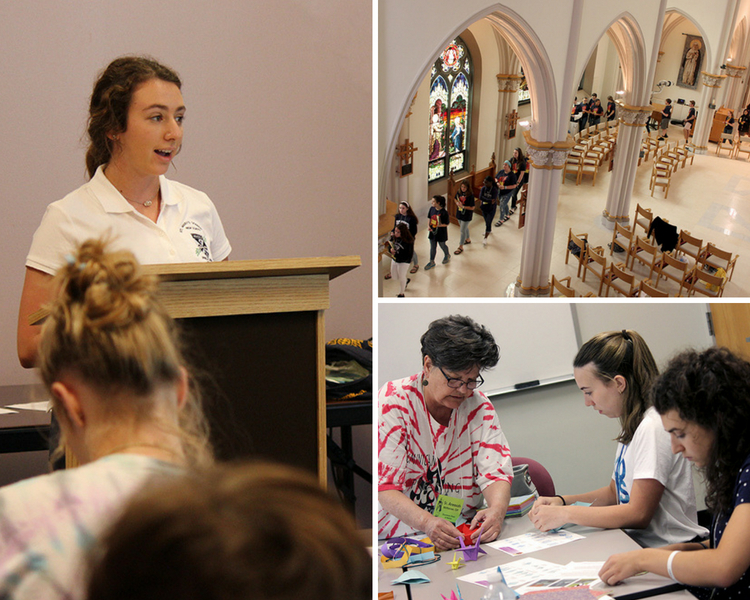 Clockwise from left: Students practice their preaching skills during a Liturgical Preaching workshop presented by Sister Sara Fairbanks, OP. High school preachers participate in a rosary procession through Holy Rosary Chapel. Sister Aneesah McNamee, OP, demonstrates the art of folding paper cranes.